Emma just graduated college with a degree in Anthropology, and is taking time to reconnect to herself and her environment. As a little girl, Emma grew through White Pine’s after school programs as well as Outdoor Girls. Throughout high school she teen volunteered for Summer Camp, and became Summer Camp staff in 2013. Working White Pine summers kept her grounded throughout college, reminding her there is more to life than writing papers and sitting through lectures! 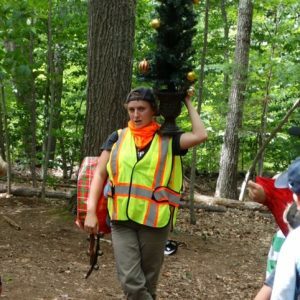 Now as a year-round staff member Emma can’t wait to bring song, spice, and maybe her woodland alter-ego Bruce to Acorn Weevils and Wild Child this year!